PACC gives thanks to Southwest Gas employees with inaugural "Snuggle Delivery"
Leaders from Pima Animal Care Center and its nonprofit partner, the Friends of Pima Animal Care Center, conducted a “Snuggle Delivery” on May 5 to thank Southwest Gas employees for their generous support through an annual giving campaign. Rescue puppies and kittens were on hand to celebrate this contribution at the Southwest Gas administrative office, 3401 E. Gas Road. 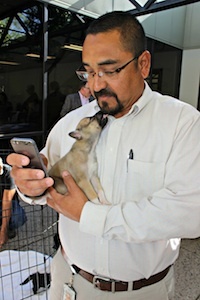 More than 20 Southwest Gas employees who supported the Friends of PACC came to the snuggle session, during which Pima County Board of Supervisors Chair Sharon Bronson urged the compassionate crew to open their homes to a PACC pet. “All PACC pets come fully loaded with a spay or neuter surgery, microchip, vaccinations, and a free vet visit, too,” Bronson said. Since 2015, Southwest Gas employees have pledged more than $47,000 to the Friends of PACC through the company’s Fuel for Life employee-giving program. During the May 5 Snuggle Delivery, Southwest Gas leaders presented the Friends of PACC with a check for this year’s pledge of $27,000. 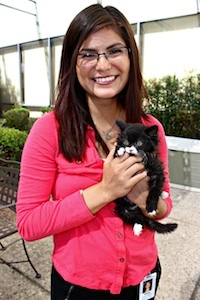 In return, employees received cuddles from homeless pets whose lives were saved by these donations. Additionally, a doctor from PACC’s medical team attended to answer questions about the tremendous progress happening at PACC, the community’s only open-admission shelter, which hit a historic 90 percent adoption rate in 2015. The Southwest Gas employees’ gifts have helped fund medical equipment and supplies such as IV fluid pumps to save pets who’ve been hit by cards, pain medications for pets whose legs needed amputation, and antibiotics to help pets heal from injuries and illness. those less fortunate,” said Julie Williams, Southern Arizona Division Vice President for Southwest Gas. Four puppies and two kittens, all of whom were raised in PACC foster homes, were the biggest stars of the event. Two of them even found homes with Southwest Gas employees!